Audiolab Q-DAC is a stripped-down M-DAC for £399 | What Hi-Fi? 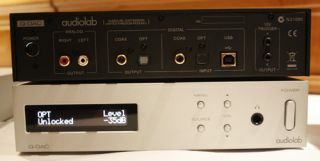 Spotted tucked away in the corner of the Audiolab room was this, the £399 Audiolab Q-DAC. It's essentially a stripped-down version of the Award-winning M-DAC created to hit a more affordable price point. IAG's director of acoustic design Peter Comeau says it offers "98% of the performance of the M-DAC for £200 less." There's less functionality on the Q-DAC, which does without the remote control circuitry and balanced outputs of the M-DAC, and it has a smaller display. It also only has one coaxial and one optical digital input, where the M-DAC has two of each. But you do get a headphone socket, USB connectivity, analogue RCA output and 'menu' and 'source' buttons. The Q-DAC can handle hi-res 24-bit/192kHz files via the coaxial input and the USB input, but only 24/96 over optical. The story says that the Q-DAC "can handle hi-res 24-bit/192kHz files via the coaxial input, but is limited to 24-bit/96kHz over optical and USB". Actually, the Q-DAC can handle data up to and including 24-bit/192kHz files via asynchronous USB, in addition to coax. Sharing the stand with the Q-DAC is the new Audiolab M-PWR power amp (£499) designed to go with the M-DAC (which acts as a preamp) to make a stereo system. There are balanced inputs and speaker binding posts on the back, and claimed power output is 40W.